Home cooks can easily get tripped up by the main difference in preparing wild salmon versus farmed salmon: wild salmon cooks faster than farmed. In the time it takes to cook a fillet of farm-raised salmon to a tender medium rare, a wild fillet will dry out and have lost much of its depth of flavor and luscious texture. The reason why wild salmon cooks faster than farmed is simple: wild salmon is a leaner fish. Why is Wild Salmon So Lean? The leanness of salmon has to do with how it spends its life. In the wild, a healthy salmon journeys out of the fresh, Alaskan tributary of its birth to take up the long, tireless hunt for food in the rough waters of the Pacific. By nature an intensely migratory carnivore, the salmon clocks thousands of miles over its lifetime before finally returning to its birthplace. There, it undertakes a grueling uphill climb to reach its spawning grounds, expending all of the nutrients and energy it has left before finally expiring. It’s an epic cycle of life that’s been happening for eons. Because of this physically demanding journey, a wild salmon is a lean machine. Its flesh is significantly leaner than that of farmed salmon, which are often confined to a feedlot where their lifestyles are unnaturally sedentary. The penned up carnivores cannot migrate to hunt; instead, they are normally fed diets supplemented with corn and soy-based feeds. The type of fat that dominates farmed salmon is also different. Both wild and farmed salmon are rich in omega-3 fatty acids, but farmed salmon also contains large amounts of omega-6s — the same type that you usually find in deep-fried and processed foods. When comparing wild and farmed fillets of salmon side-by-side, it’s easy to differentiate which is which by observing the visible fat content: farmed salmon is notably veined with extra fat, whereas wild salmon is more uniform in color, saturated in deep red or pink tones. Since wild salmon doesn’t have all that extra fat, it cooks a lot faster than a farmed fillet. As with other lean meats, this means you should apply the correct cooking method or reduce cook time to ensure your fish is done perfectly. 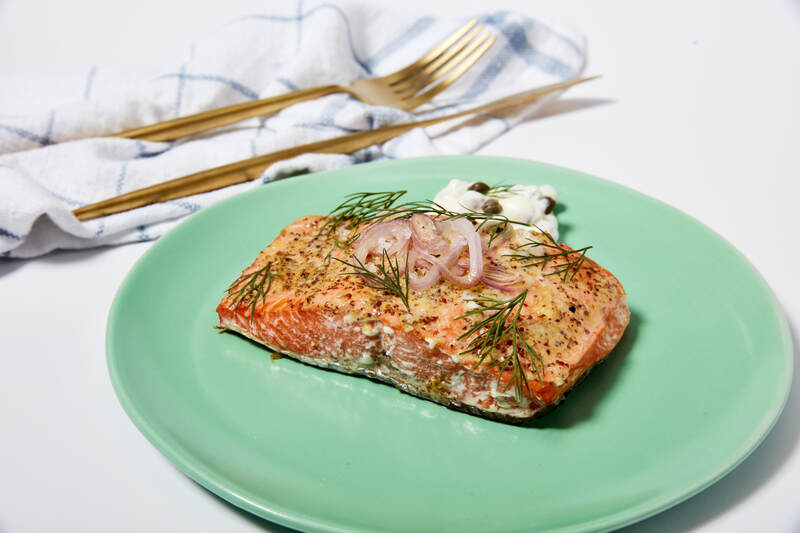 When following a recipe to prepare your salmon, check to see if it calls specifically for wild salmon. If the recipe doesn’t specify, you can assume that it’s designed around a farmed fillet since farm-raised salmon dominates the mass market. To adapt a recipe to wild salmon, simply reduce the total cook time by a few minutes to prevent from overcooking your fillet. If the recipe calls for 15 minutes, check your fillet at the ten-minute mark for doneness. If it calls for five or six minutes per side in a hot pan, check it at three minutes. For even more precision in cook time, just follow these simple guidelines on when to pull your salmon from the heat. You may also want to consider using more forgiving methods of preparing your wild salmon fillets. Poaching your fish or baking it at lower temperatures will make it easier and less crucial for you to pinpoint when exactly your wild fillets are cooked to your desired doneness. Gentler cooking methods can help fillets retain their juices, so an extra minute or two on the fire is less likely to dry them out.